I have just discovered Kasie West this year and I have fallen in love with her super cute, fluffy and swoon worthy contemporaries. 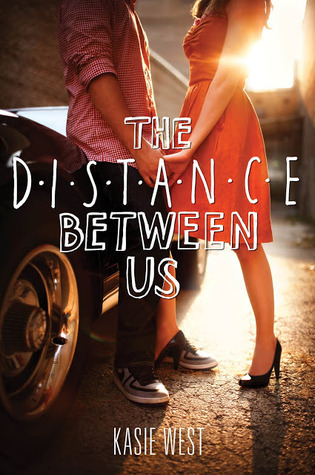 The Distance Between Us was so adorable and lovely and I basically finished it in a day. This is the perfect book to read if you want to get over a reading slump. Allow me to flail about why I love it so. The sarcastic, dry wit of main character Caymen. Really, Caymen is my sarcastic spirit animal. I loved her wit and dry humor throughout the book. I want her to be my friend so we can just talk in sarcasm all the time. Caymen in general. I mean, I would give this book all the stars because of the sarcasm alone, but really Caymen in general is just an amazing character. I love how mature and responsible she is. Due to circumstances she has had to grow up pretty quickly and take on a lot of responsibility early on. She’s one of those teenagers who don’t stay out too late because they have to get up early for work in the morning. Respect! A lovely, slow-burn, friends-first romance. I loved the romance in this book, because the development of the feelings was just so real and believable. Caymen and Xander came from different worlds and seeing them get to know one another and then slowly fall for eachother was just so freaking adorable. This was character and relationship development done right! Also, how sweet was Xander? The mother-daughter relationship. The whole relationship between Caymen and her mother is very Gilmore Girls-esque. I loved their closeness and seeing how much they would sacrifice for the other. Of course, there are things happening in the book that push this closeness a bit to the background, and I do wish we would have gotten to see a bit more of it, rather than being told about it. Relatable life issues. Both Caymen and Xander struggle with the question “What do I want to do with my life?” and this is just so relatable! Definitely for teens, because who really knows what they want to do for the rest of their life at the ripe old age of 17? I mean, I barely know what I want to do at 31! So definitely relatable. I also quite enjoyed watching Caymen and Xanders’ career days. Really, there was only one downside to the entire book and that was the ending. It was just a bit sudden and a weird combination of feeling too neatly wrapped up and not wrapped up enough. But overall, I very much enjoyed this book and recommend it to anyone looking for something cute and fluffy with LOTS OF DELICIOUS SARCASM! Have you read The Distance Between Us? What did you think about it? LOVED THE QUOTES. (and your review too!) I am so sarcastic, my friends are just tired of me XD I might give it a shot despite not liking The Fill in Boyfriend CAUSE SARCASM, LINDSEY. Oh, the sarcasm in this is AMAZING! Caymen is my spirit animal, her wit and sarcasm are glorious 😉 I liked The Fill-In Boyfriend too, but the characters in this are SO MUCH BETTER! I really enjoy fluffy books with lots of sarcasm 🙂 I might have to check this one out – although sad to hear the ending didn’t do much for you. I’m not a fan of loose endings…. Don’t let the ending scare you off, I didn’t like it but I’m having a hard time putting into words why exactly. So maybe you’ll still like it!